John Matthew Pocisk was born in rural Ohio near Toledo in 1940. He learned to play the saxophone. Poscisk formed his first band while he was in high school. Subsequently, he formed a band in October 1957 name the Orbits. The name was taken from news stories about the Space Race between the USA and the USSR that began in the mid-50’s. On October 4, 1957, the USSR had a successful launch of Sputnik 1 which was the first space craft to orbit the earth with a human on board. The Orbits were based in Toledo, Ohio. They developed a following and were soon noticed by talent agents who heard one of their demos. The Orbits were approached by Harry Balik and Ira Micahnik of Artists Inc. in Detroit. Balik and Micahnik managed Little Willie John and the Royaltones. and taken under the wing of management who had their name changed to Johnny And The Hurricanes. Johnny Pocisk was billed as Johnny Paris while performing with the Hurricanes. In early 1959 Johnny And The Hurricanes released their first single titled “Crossfire”. The song climbed to #7 in Buffalo, Denver and Ottawa, #9 in Vancouver and San Francisco and #23 on the Billboard Hot 100. Their follow up single, “Red River Rock”, became their biggest hit. It climbed to #5 on the Billboard Hot 100, #2 in Vancouver, Los Angeles, Boston and Toronto, #3 in Kansas City, Phoenix, Providence, New York and New Orleans, #4 in San Francisco, Philadelphia and Montreal, #5 in Chicago and Syracuse (NY), #6 in San Antonio, Calgary and Detroit, and #7 in Memphis, Denver, Milwaukee, Pittsburg and Seattle. The single peaked at #3 in the UK. 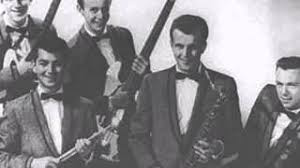 In the winter of 1959, their next single was “Reveille Rock.” The single climbed to #2 in Denver, #4 in Providence (RI) and Newport News (VA), #6 in Louisville and Chicago, #8 in Montreal, #9 in the Twin Cities and Cleveland, #10 in Philadelphia and #15 in Vancouver. At the end of the year the band released a single with the A-side titled “Beatnik Fly”. The B-side was “Sand Storm”. While the A-side climbed to #15 on the Billboard Hot 100, (and #8 in the UK) the B-side, “Sand Storm”, didn’t make the Hot 100. But it reached #3 in Vancouver, together with “Beatnik Fly”. Aside from Vancouver, “Sand Storm” had a notable success in Jacksonville, Florida, climbing to #12. “Sand Storm” was part of a new instrumental sound that was part of an emerging fusion that became associated with surf music. 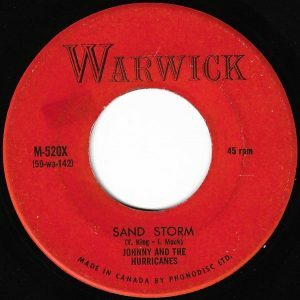 “Sandstorm” also gave a nod to what became dubbed as “Space Rock,” that was most successfully featured in the 1962 instrumental “Telstar” by the Tornados. “Sand Storm” was co-written by Tom King and Ira Mack. King was the alias for Harry Balik. Mack was the alias for Irving Micahnik the co-owner, with Harry Balik, of Twirl Records. Micahnik was born in 1905 in the Bronx. Balik was born in 1925 in Detroit. Balik’s parents were Russian Jews. Balik managed the Krim Theatre in Highland Park. King (Balik) and Mack (Micahnik) also licensed much of their music to Big Top Records. King (Balik) also wrote spoken word lyrics that were recorded in 1960 by Tom Clay. Clay was a DJ who in 1971 recorded “What The World Needs Now Is Love”. In 1960 Johnny And The Hurricanes released “Down Yonder” which made the Top 30 in Vancouver and #8 in the UK. In the fall of the year “Rocking Goose” climbed to #8 in Vancouver, making it the best chart run for the single in the USA or Canada. The tune also climbed to #3 in the UK. In October 1962 Johnny And The Hurricanes headlined a number of concerts at the Star Club in Hamburg, Germany. The opening act for their concerts was a new band from the UK named The Beatles. Between the summer of 1962 and early 1963 Johnny And The Hurricanes had regional top 30 hits in Vancouver with “Come On Train”, “Minnesota Fats” and “(Theme From) Whatever Happened to Baby Jane?” They went on a tour across Britain in 1963. However, their star was fading. From 1961 to 1967 the band released 17 singles. The first two barely cracked the Billboard Hot 100, while the rest missed the all-important music industry charts. According to the History of Rock.com, “None of the Hurricanes received acknowledgment or royalties, for songwriting, though most of the arrangements were worked out by the group.” All their songs were credited to King and Mack (Balik and Micahnik). In 1961 Harry Balik co-produced “Runaway”, a #1 hit that year for Del Shannon, and Shannon’s followup hit “Hat’s Off To Larry”. He also produced “What’s Your Name” for Don and Juan in 1962 for Big Top Records. In 1966 Balik discovered a group called Shades Of Blue who had a hit in 1966 titled “O How Happy”. That year he also discovered Sixto Diaz Rodriguez, an obscure eccentric genius in Detroit. Rodriguez was unknown in the USA but went on to become a huge success in South Africa. A film titled Searching For Sugarman was made about Rodriguez’s music career in 2012. In 1968, Balik was appointed the head of A&R for Motown. In the late ’60’s Balik discovered a Detroit group named the Sunliners and renamed them Rare Earth. The group went on to have numerous hits for a subsidiary of Motown. Balik was also pivotal in pushing Motown to release Marvin Gaye’s “What’s Going On”, which Berry Gordy disliked. Balik remained with Motown until 1977. In 2013 Harry Balik attended the Detroit Music Awards, where he received the Distinguished Achievement Award. Johnny Paris (Pocisk) moved to Germany in the 1980’s and moved to Ohio in the 1990’s. In Ohio he left the music industry for awhile and sold antiques and vending machines. Latter on Pocisk managed a talent agency. Johnny And The Hurricanes continued to perform in Europe until 2005. John Pocisk died in 2006 at the age of 65. “John M. Pocisk, 65; Was Johnny Paris in Johnny & the Hurricanes,” Los Angeles Times, May 10, 2006. Johnny Paris, Leader of the Hurricanes, The Independent, May 6, 2006. June Harris, “Johnny & The Hurricanes: They’re Wild Man, Like Crazy,” Disc, January 30, 1960. Obituary for Harry Balik, Hebrew Memorial Chapel, 2006. “Irving Michanik bio,” Black Cat Rockabilly. Logan T. Hansen, “Motown music producer Harry Balk dies at 91,” Mlive.com, December 5, 2006. “Johnny And The Hurricanes,” History of Rock.com. Ian Dove, “Johnny and The Hurricanes: Gaumont State Ballroom, Kilburn, London,” New Music Express, January 18, 1963. Bill Millar, “Johnny and the Hurricanes: Stormy Weather,” The History of Rock, 1982.